Erie Aquaponics | Fresh. Local. All Year. This is my last week on the project! My year-long contract to help the UECDC get the aquaponics project up and running has ended. The project has come a long way since I got involved in March 2011. Erie Aquaponics now has a complete business plan with financial projections, a logo, a blog, a five-year lease agreement for a 2.44 acre site, architectural plans for the hoophouse, and equipment including a hoophouse frame, 400-gallon aquaponics tank and grow beds (courtesy of the ES Department at Allegheny College) and other growing supplies. A missing ingredient is still money to get the utilities and fencing installed so that the site becomes viable for an aquaponics greenhouse. With a small amount of capital, Erie Aquaponics will be able to turn all of these resources into a thriving urban farm! Questions regarding plans for the project can now be directed to Gary Horton, Exective Director of the UECDC. If you have any leads on funding for the project, please contact Gary at (814) 899-3904 or ghorton@uecdc.org. I want to thank all the staff at the UECDC, our wonderful Roundtable Team, and all of our community collaborators. And thank you for your continued interest in and support of Erie Aquaponics! 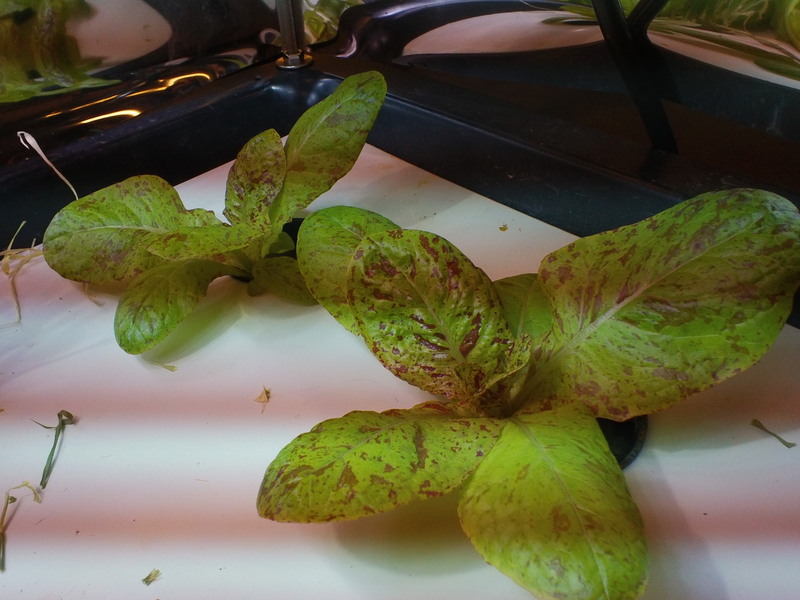 Annie is testing 11 lettuce varieties (including romaine, butterhead, batavian, and oakleaf types), 4 spinach varieties, and 2 parsley varieties for their consistency of germination, heat tolerance, cold tolerance, disease resistance, taste, color, texture, and days to maturity within an aquaponics system. These are all great varieties from a trusted seed source, Fedco Seeds (highly recommended!). Fedco Seeds is a Grower’s Cooperative in Maine that sells many Certified Organic products and has signed the Safe Seed Pledge stating that they do not sell any genetically modified (GMO) seed. The prices are excellent as well as the quality. So why is Annie testing this all out if Fedco has already done that? Aquaponics is different. Germination happens differently, transplanting works differently, and some varieties that perform a certain way in soil may not do the same in water. Filtered tap water was used to soak the rockwool. Rockwool has a high pH, and Erie’s water also has an alkaline pH. The pH may cause germination problems, but so far no major ones. If the alkalinity is a problem, the rockwool can be soaked in a lemon juice solution to acidify it. We have formed as Limited Liability Company! This is a big step for us, we are now in the process of setting our bylaws, getting bank accounts set up, etc. This is the time for all of those less-exciting steps that are necessary to turn a vision for our business into a reality. You may be wondering, what about our cooperative structure? The answer is that as a fledgling business with no real capital to work with (yet! ), a cooperative structure at this stage of the game would hinder more than help our cause. It seems that it will be easier to initially form and fund an LLC and then to be able to have the flexibility to shift to a worker-owned structure as our business grows. Erie Aquaponics attended a great meeting hosted by the Erie County Health Department, with the intention of forming a team of individuals and organizations looking to improve access to healthy foods in Erie. We’re still in the very preliminary stages, but with organizations such as the Erie Chamber, AmeriCorps *VISTA, the Whole Foods Cooperative, and others, this coalition is looking to be a promising force for positive change in Erie. Stay tuned! We’ve shot, edited and uploaded our video request for YOU (and your friends) to support our national Kickstarter campaign. 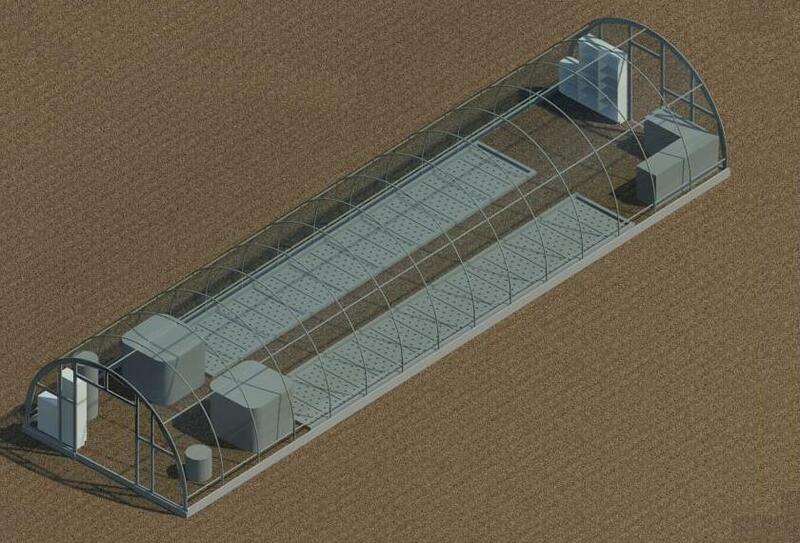 Our initial goal is to raise $15,000 for our first greenhouse. Not familiar with Kickstarter? It’s a crowdfunding website where creative projects are funded by individuals all over the country (and world) in exchange for rewards such as t-shirts, fresh produce, etc. The “kick” is that if we don’t raise our full amount of $15,000, we won’t receive any funding. We’re looking forward to the challenge! 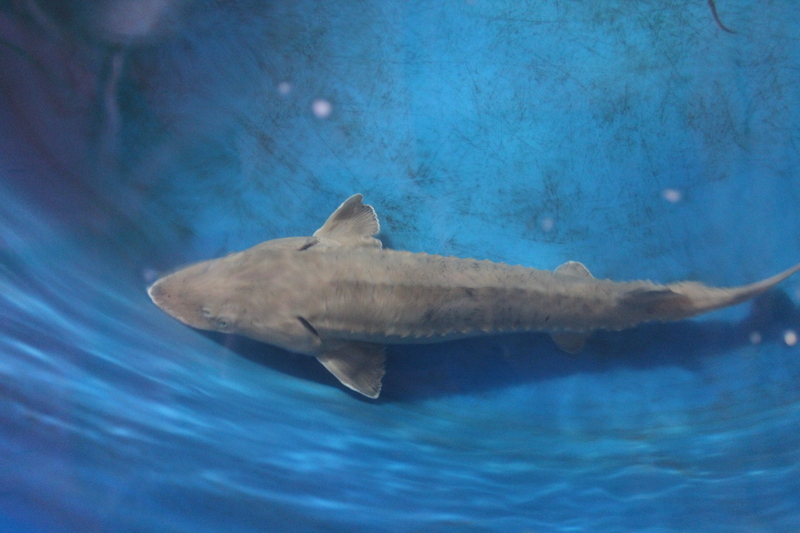 Pledge $500 or more – “The Sturgeon” – The ULTIMATE harvest experience – Come as an honored guest to our first fish harvest. You will catch your own yellow perch in nets, weigh them, and take them home on ice in a cooler, along with a share of the bounty of lettuces and herbs that we have growing! Right now we’re waiting for our submission to be reviewed by Kickstarter. Our launch will begin shortly after we hear back from them! Check out our portable raft demonstration system built by Don Benson! 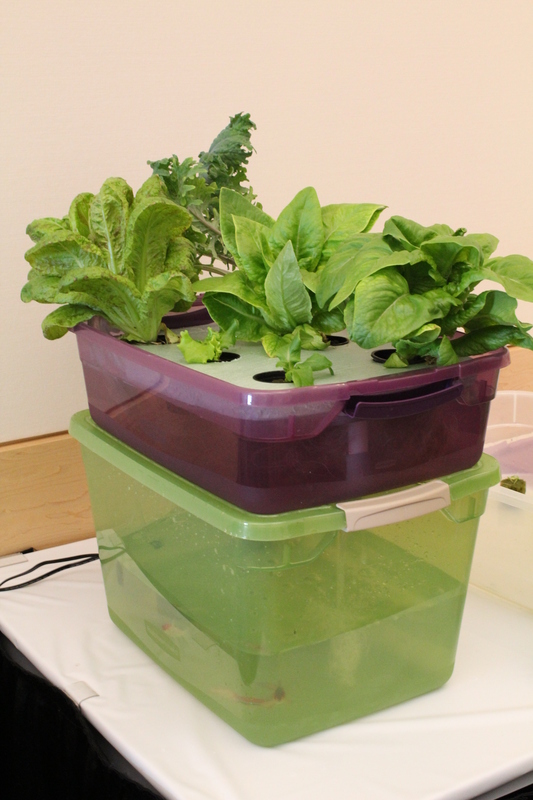 The system is constructed from two plastic tote containers and a small aquarium pump. Water is pumped from the bottom fish area up to the plant tray. There is a standpipe in the top raft tray that determines the water level, and allows the excess to flow back into the fish tank. Annie miked up and presenting at the Home and Garden Expo. 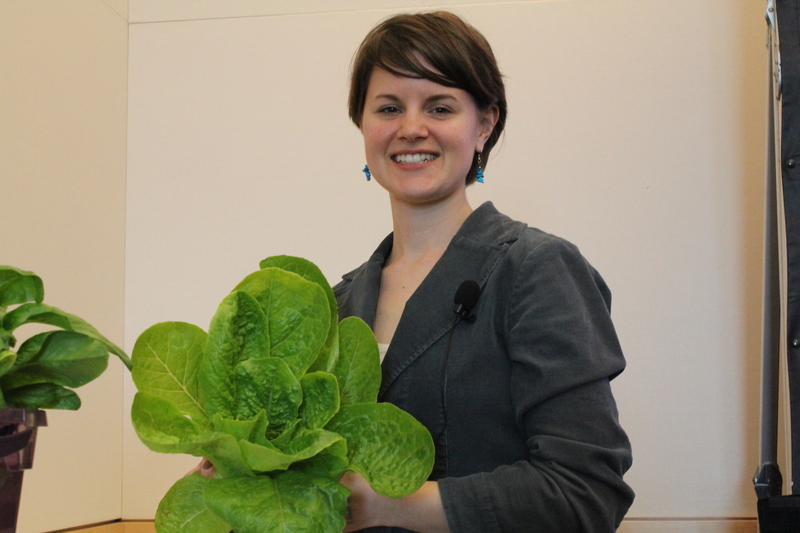 Annie shows off one of our choice heads of romaine lettuce. Another view of the demo system -you can see the fish in the bottom tank. There are three goldfish in this system! Hello all, sorry the updates are late this month (must’ve been February’s odd number of days). 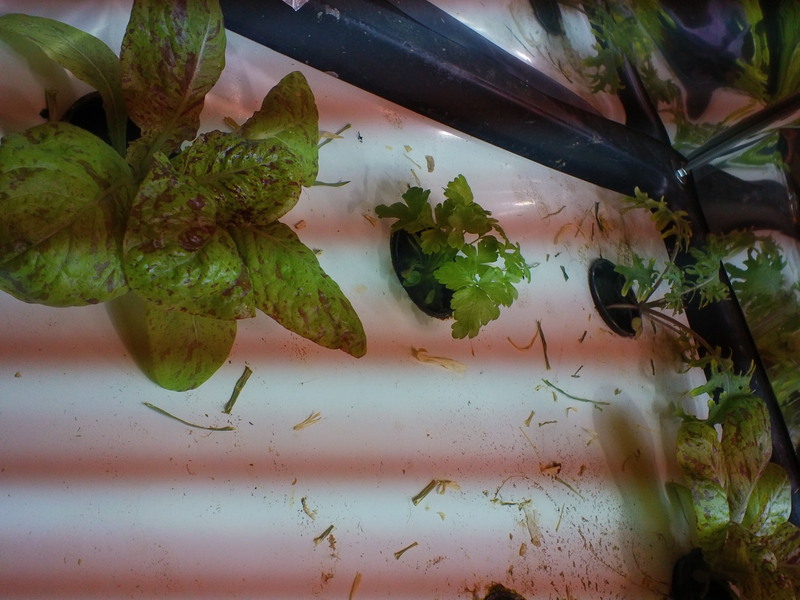 After a bit of a sluggish start, our crops in the TREC aquaponics systems have taken off and are looking really nice – the photos don’t quite do them justice. The crops in the sturgeon system are especially looking good (not a fish typically used in aquaponics). If you haven’t seen the photos, check out the album on our Facebook page – or better yet check out the aquatics lab at the TREC for yourself. One of our favorite speckled romaine varieties – sweet and crisp when it’s at full size! 20 days from transplant pictured here. Ah, to be in a warm greenhouse looking out at the Erie snow. 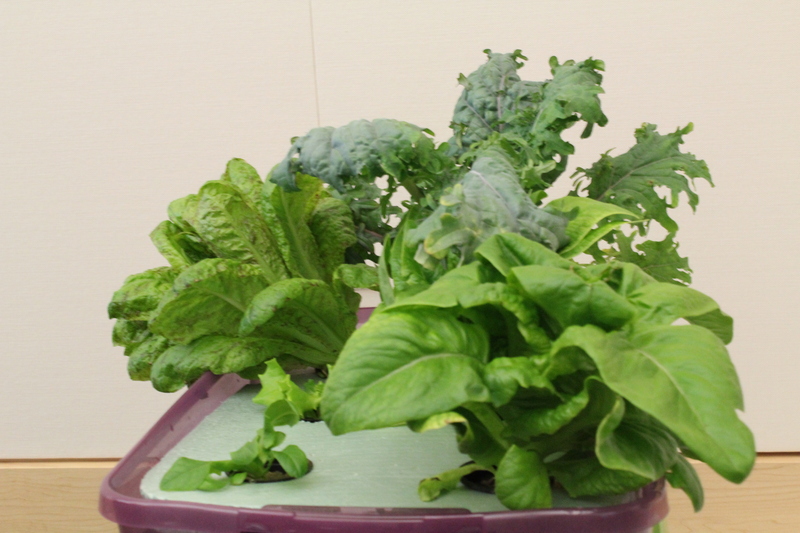 Erie Aquaponics has started growing lettuce, kale, mustard greens, basil, and parsley at the greenhouse and aquatics lab in the Tom Ridge Environmental Center. It’s proven to be a win-win situation for EA as well as the PA DCNR because we get to start growing crops for demonstration purposes and to get in the swing of crop rotation before our greenhouse is built. And for DCNR, their aquatics lab will have a lively and maintained group of plants for visitors to see. Thanks to Ray Beirbower for his help with this project! 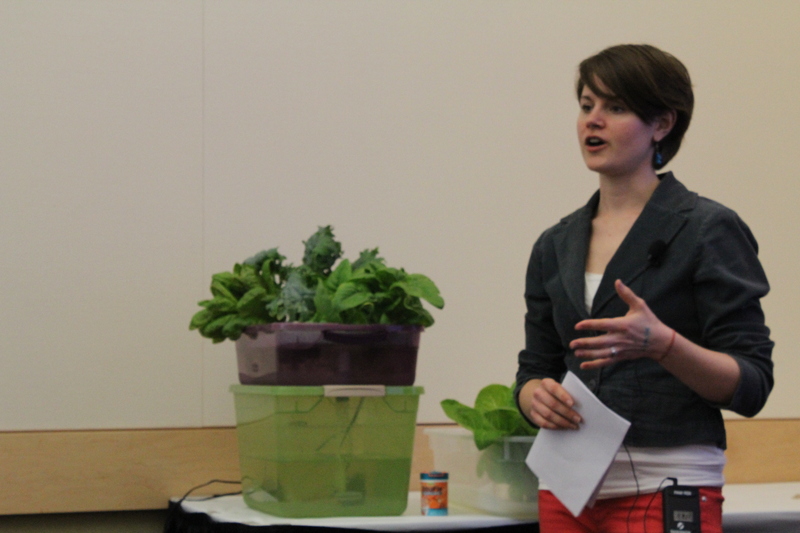 I’m returning from a weekend trip to Milwaukee, my brain stuffed with information about aquaponics and urban farming. First I visited Sweet Water Organics on Friday – they use all raft method systems with head lettuce, herbs, tilapia and perch. 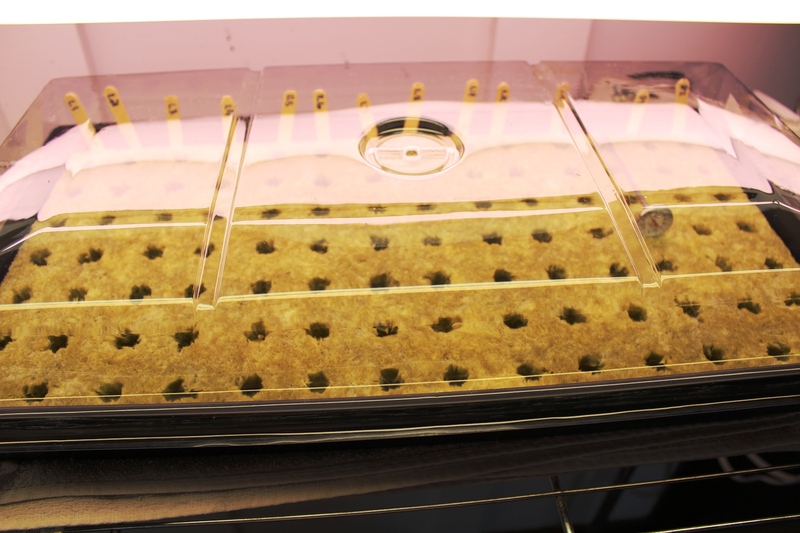 They also grow many sprouts in trays. The approach was similar to what I’ve seen at Cheyney University, with all of the systems connected via the same water flow. As you can see from the photo, it’s not very sunny inside the warehouse there, which makes electricity for the lights the largest expense. 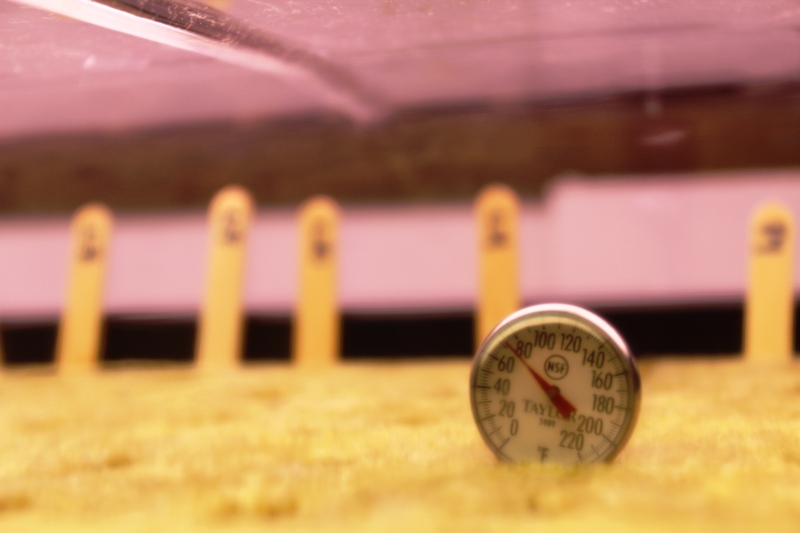 Heating costs are much lower than in a winter greenhouse, however, with the warehouse easily staying at about 65F year-round. View from the upper deck at Sweet Water. Check out more Sweet Water photos on our Facebook page here. On Saturday and Sunday I spent my time at Growing Power for the “Growing Community Food Systems from the Ground Up!” Training. All the meals were delicious and included salad greens and micro greens – even breakfast. We started with a tour by Will Allen (on crutches due to his recent hip replacement). 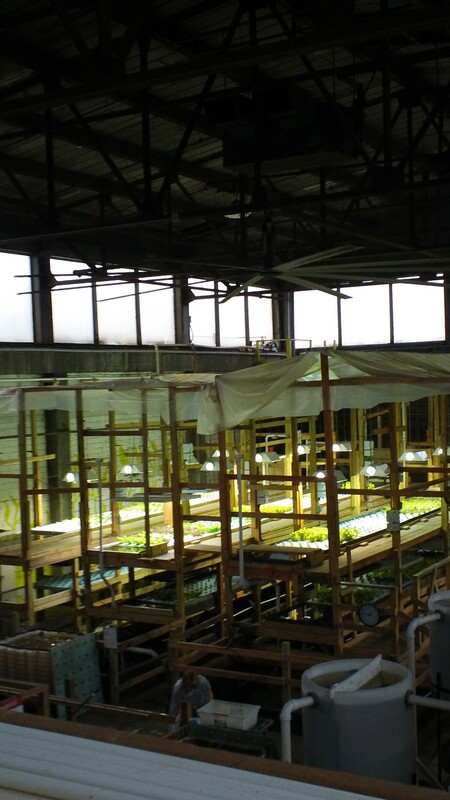 The facilities include 7 aquaponics systems in greenhouses (the water is heated but the air is not), many hoophouses for intensive raised-bed production, micro green (sprout) production in greenhouses, laying hens, ducks, turkeys, and goats. Growing Power also has a large solar array used to heat the water in the greenhouses, and a rainwater catchment system that connects gutters from all the greenhouses into a catchment basin, and back into the greenhouses. I attended the aquaponics workshop, in which we built a 4ft x 4ft x 4ft tank out of wood and a rubber pond liner. The system was about 200 gallons with a 4ft x 4ft grow bed on top of it. Growing Power offered a new model of aquaponics than I have been used to, with each system mimicking a freshwater stream. They use pea gravel as the medium and allow a constant flow of the water from the fish tank, with the build up of bacteria on the medium acting as a biofilter for the water. The only plants that were grown directly in the water were watercress and nasturtiums. Also in the aquaponics systems were 1 gallon plastic pots filled with gravel, compost, and vermicompost (worm castings). The bottom of the pots soak up the water from the system and grow from there. Crops in the pots were salad greens, micro greens (beets, cabbage, kale, radish, etc.) and flowering crops like peppers.